If you enjoyed “God’s Not Dead,” you are sure to enjoy the highly-anticipated sequel “God’s Not Dead 2” by Pure Flix Entertainment. Although “God’s Not Dead” had mixed reviews, it had a huge impact, and the numbers don’t lie. The film grossed more than $60 million on a $2 million budget. Released in both English and Spanish, the film features an all-star cast including Melissa Joan Hart, Jesse Metcalfe, David A.R. White, Sadie Robertson, Pat Boone and the late Fred Thompson. Cameo appearances are made by the Newsboys, Mike Huckabee, Lee Strobel and J. Warner Wallace. In “God’s Not Dead” the question, “Is there really a God?” was answered in the college classroom. In “God’s Not Dead 2”, the setting moves to the public school and courtroom. The question progresses to, “Who is Jesus?” Beloved Christian high school history teacher, Grace Wesley is asked an honest question about Jesus’ actions and teachings within the framework of the day’s lesson. When Wesley’s response includes a passage of Scripture, she quickly finds herself in trouble with the principal, superintendent, disgruntled parents and a civil liberties group. The result is an epic court case that could cost her the career she loves and expel God from the classroom. Wesley chooses to stand for faith even if it costs her everything. The film accurately portrays what Christians feel is a growing trend in America – the exclusion of the Christian faith from public life. Filmmakers note that the story is inspired by real legal cases. Actual cases are listed at the end of the film. The courtroom scenes and defense which included expert witnesses Lee Strobel and J. Warner Wallace testifying to the existence of Jesus were outstanding. 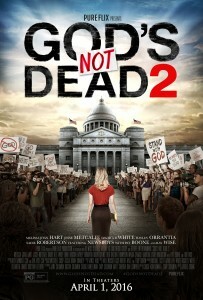 While some new characters were introduced in the film, the story lines of some beloved characters from “God’s Not Dead” continued and were delightfully received by the audience. Connections between the characters were revealed throughout the movie rather than at the end. The movie was humorous, entertaining and inspiring and will cause moviegoers to question how much they would risk to stand up for their beliefs. The movie portrays general hostility to Christianity and Christian principles. While this is not true in every community in our country, it is true that many Christians have seen aspects of this attack on their faith and on them as believers. The cast is a little cluttered with limited time devoted to develop all the characters. It is a bit predictable and a little “cheesy” at times. God’s Not Dead 2 Church Kit – a four-week group study and sermon series incorporating Scripture and video clips from the film. This is designed to challenge people to discover what they truly believe and give them a firm foundation to defend their faith. Be sure to stay through the credits to see the trailer for “God’s Not Dead 3”. This film will address an issue near to every pastor’s heart – his sermon notes.